Astronauts are about to hand off a tedious, daily task to an adorable robot friend developed by engineers at the Japanese Aerospace Exploration Agency. Its name is Int-Ball, and it’s a tiny, 3-D printed drone that is designed to hover around the International Space Station and take photos or video. It was successfully delivered to Japan’s experimental lab on the ISS, called Kibo, on June 4. And… just look at it. What does Int-Ball actually do in space? Before Int-Ball arrived, astronauts aboard the ISS wasted about 10% of their working hours documenting the crew’s daily lives. Now, the circular, camera-equipped drone — which oddly looks a bit like Weebo from the 1997 film Flubber — is able to autonomously maneuver and document what’s going on inside for them. Scientists back on Earth can see the Int-Ball’s images and videos in real-time. In fact, JAXA recently released video footage detailing how the ISS looks from the Int-Ball’s perspective. This allows “flight controllers and researchers on the ground to check the crew’s work from the same viewpoint as the crew,” a JAXA release reads. 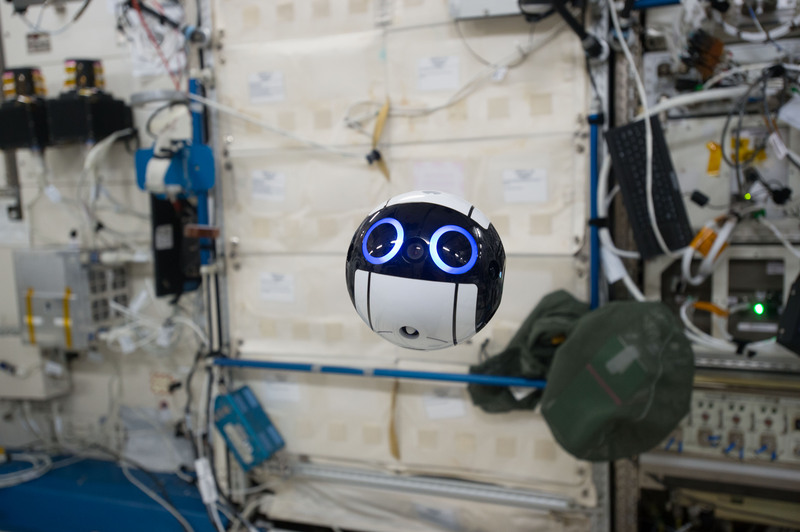 With a set of two big, blue eyes, the Int-Ball will at the very least make for friendly company to the astronauts as they work, like a high-tech Wilson from Cast Away. And in the future, perhaps some of the most iconic photographs documenting life in space will be taken by robots.